A talented guitar instructor and writer, Brad has been a columnist for Flatpicking Guitar Magazine since 1996 and is currently Takamines main guitar clinician, conducting dozens of music store clinics for Takamine each year. He has taught at Steve Kaufman’s Flatpick Camp, Nashcamp, Camp Bluegrass, the St. Louis Flatpick Weekend, the Roanoke Bluegrass Weekend, and more. He has also produced four instructional DVDs for Flatpicking Guitar Magazine, “Flatpick Jam”, Volumes 1, 2, & 3 and a book/DVD/CD course called “Flatpicking the Blues”. Additionally, he has produced several instructional courses for Mel Bay Publications, including the “Blue Book of Speedpicking”, and a series of instructional Ear Training Cds. After spending years on the road playing country with Marty Stuart, bluegrass with Earl Scruggs, newgrass with Sam Bush, Gypsy jazz with John Jorgenson, and rock with Billy Bob Thornton, Brad Davis steps out front to prove that he can hold his own as a solo artist, songwriter, and band leader. 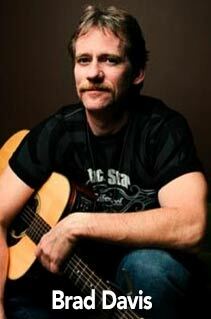 Brad Davis spent ten years (1992-2002) performing on stage as a member of Marty Stuart’s road band. For the past six years he has played lead acoustic guitar with Earl Scruggs and Friends, and for the past five years he has played lead electric and acoustic guitar with movie actor Billy Bob Thorntons rock band. He spent two years (2003-2004) as the guitar player for the Sam Bush Band and also performed with John Jorgensons Gypsy jazz Quintet in 2005. He occasionally performs with an exciting new bluegrass band, calling themselves “Greenbroke,” consisting of Brad Davis, John Cowan, John Moore, and Dennis Caplinger. Brad has worked for, or recorded with, Willie Nelson, Emmy Lou Harris, Pam Tillis, The Forester Sisters, Tommy Shaw (Styx), David Lee Roth (Van Halen), Sheryl Crow, Sam Bush, Warren Zevon, and The Sweethearts of the Rodeo. He is currently the host of Commerce County Line, a singer/songwriter television program on the iTelevision network (see www.myccl.tv). Additionally, Brad has recorded two album projects featuring Billy Bob Thornton on Mercury Records and has toured both Europe and the United States as the lead guitar player for Billy Bob Thorntons band. Brad’s two solo recordings on FGM Records “I’m Not Gonna Let My Blues Bring Me Down”, and “This World Ain’t No Child Anymore” were both released to rave reviews. He also appears on an FGM concert DVD video release “Live in Kansas City” with Cody Kilby and Tim May. A prolific songwriter Brad has had his songs recorded by various country and bluegrass artists, including country star Tim McGraw (A’int No Angels). He has played on Marty Stuart’s gold selling album “This Ones Gonna Hurt You”, the Marty Stuart “Hit Pack”, and Marty’s last MCA recording “The Pilgrim”. He played on the soundtrack of Steven Seagals “Fire Down Below”, and performed music for Billy Bob Thorntons Miramax releases “Daddy And Them” and “Waking Up In Reno”. He also recorded with Sheryl Crow, and others, on the Johnny Cash tribute album “Kindred Spirits”, played guitar on Warren Zevons final Grammy-winning recording, “The Wind”, and was on Sam Bush’s Sugar Hill release “King of My World”. For more information about Brad, visit: http://BradDavisMusic.com.